Ender Wiggin is a third, the third child in his family born. He was made because his siblings showed lots of potential but failed. They all need Ender to be the one. They need him as a commander to win the war against the buggers. Ender doesn't know if he's up to it. He is only six when they take him to the school to make him all that he can be. Sometimes the teachers might underestimate him though, even when he thinks he can't win, Ender might just have enough luck to pull through. So I went into this book not really expecting to like it all that much. It was recommended to me time and again, but I just though Sci-fi, space, really?!?! I really ended up loving this novel though. Ender was such a complicated but likable character. I felt complete sympathy for him, and just wanted to hug him and tell him he would be ok. They did some terrible things to him, the teachers, the students, his siblings, but still he persevered. This novel is about a lot more than just space and war with the buggers though. There are lots on underlying conflicts about the human condition. 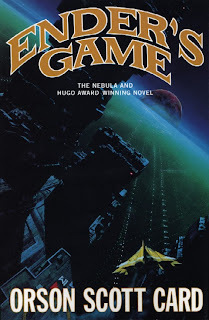 It was a well-rounded novel that left me hungry for more of Ender. This book was funny, but serious, easy to read but obscure. 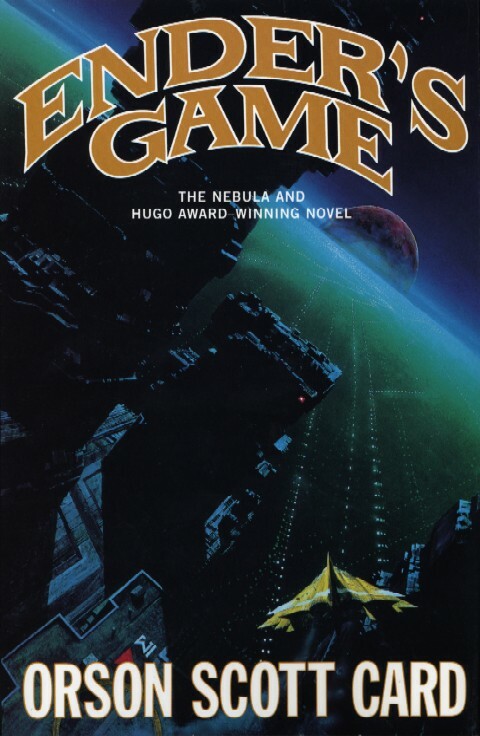 Orson Scott Card certainly knows how to write (well, obviously, he's won quite a few awards and such). I loved all the little details like the video game that Ender plays, it is described so well, that I could almost picture myself playing. The one thing that did bug me in this novel is Ender's voice. He was an incredibly intelligent and advanced six-year-old and because of his advancement, he never sounded like a six-year-old really. The insults that the boys spout out are the only real indications that they are all younger than teenage. There is some minor racists comments between the kids in the version I read, but they have been taken out of the newer ones. They didn't play a huge part in the novel though, so I think it just makes it a better read for kids to read now. I recommend everyone who hasn't read this book should pick it up. It was truly a fantastic read, that pulls at your insides. "'I've watched through his eyes, I've listened through his ears, and I tell you he's the one.'" "Or perhaps he had meant to eat the snake alive, as Peter in the mirror had done, with his bloody chin and the snake's tail dangling from his lips. But he kissed it instead." My hubby really enjoyed this book when he read it a while ago, it's something that I always mean to get round to! Overall time had to hack facebook account depends on protection procedures and also password toughness, personal privacy choices set for that specific account and extra security actions relying on your local net provider.